Let’s start with the obvious first choice: your branded website. Be it the home page, the landing pages, blog posts, or any similar media all are fair game. There is data as well to back this up. Landing pages with video generate 800% more conversion (FunnelScience). If you have a prominent video displayed, 88% of visitors stay longer on a site (MistMedia). The visitors that stay longer spend, on average, two minutes more on a retail site and are 64% more likely to make a purchase after viewing a single product (comScore). The blog posts – traditionally the bottom-of-the-barrel format in terms of marketing – enjoys increased viewership with an embedded video. According to Moz by incorporating a video into a blog post attracts three times as many inbound links compared to blog posts without video. 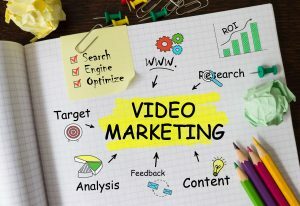 So, nearly every web-based platform shows in an increase in attention and potential sales by adding in a video. Strong results and more potential are possible in social media. According to Simply Measured, video is shared 1200% more times than links and text combined. Diode Digital also discovered that 60% of viewers will watch video before reading any site text. More importantly they will share their experience when presented with a “share this video” button. Even more encouraging, Invodo reports that 92% of mobile video viewers share video. On Twitter alone, only 700 tweets a minute include YouTube video and only 120 tweets a minute include Vines, but over 9,100 tweets are sent every second (Twitter)! These stats should be enough for most brands to start including videos in their social media updates, but many have been slow on the uptake. Speaking of YouTube, this is an industry leader and a good indicator of how video can be used to increase a brand’s social media presence. Statistics are in order here for YouTube. ReelSEO’s YouTube Statistics 2012 shows that 500 years’ worth of YouTube video are watched on Facebook every day. It is no wonder that YouTube is the world’s second biggest search engine after Google, or that YouTube accounts for 28% of all Google searches. That 500 years’ worth of video a day comes out to 3042 hours worth of video watched simultaneously across the world each second. According to YouTube, more than 1 billion viewers watch its videos each month, clocking over 6 billion hours. One hour of video is uploaded to YouTube each second, 100 hours are uploaded each minute, and get this: more video is uploaded to YouTube in one month than the three major US networks have created in the past 60 years. Many laptop and desktop viewers only watch a video for 2 minutes or less. If you think about where the average person may use a laptop or desktop – work, school, instruction, teleconferencing, etc. – this makes sense. And where is YouTube most popularly watched? Probably on your mobile phone. Translated into percentages, mobile and tablet shoppers are 300% as likely to view a video as laptop/desktop users (Invodo). This also could be because of the different platforms: online video is about 50% of all mobile traffic (Bytemobile Mobile Analytics Report), and is predicted to become 75% of all mobile data traffic by 2016 (Cisco). So, it makes sense that mobile viewers would be more accustomed to using their mobile devices to watch video. It would certainly explain why, as mentioned earlier, 92% of mobile viewers share videos. The popularity and ease of accessing mobile video doesn’t look like it is going to end anytime soon either. This makes mobile-ready websites and landing pages a definite must. And you know what else mobile devices are good for? Checking emails.